The Baadshah Gaming Live Tournament (BLT) was held from 5th to 9th April 2018 on board Casino Pride, Goa. The Rake Free April edition was all about attracting Indian as well as international poker players and stars for five days full of fun, laughter, camaraderie and of course all the poker action. The BLT April '18 came back stronger than ever, witnessing a total of 250+ participating players. The tournament was an absolute riot which saw players battle it out across five events and take away a total prize pool of a whopping 1.25 Crores. It saw a good mix of all kinds of poker players. The Tourney Favourites, the Poker Pros, the Sharks, the Novices, et al. Thus, making the tournament accessible to all, thereby highlighting the versatility of all the events organized. It also left one star-struck as the presence of Poker Pros such as Rajnish Priyadarshi, Eka Vedantham, Aditya Agarwal, Bobby Zhang, Phachara Wongwichit, Jasven Saigal, Amit Jain, Aditya Sushant, Kunal Patni, Maria Kirloskar, Dhaval Mudgal, Zarwan Tamboli, Raghav Bansal and many more only added to the excitement and grandeur of the event. One of the biggest goals of the BLT April '18 edition was to go beyond the game of Poker and provide a #SeriouslyFun experience to each and every player. True to its word, the entire crew at Baadshah Gaming and Casino Pride successfully managed to curate an unforgettable experience for the players. 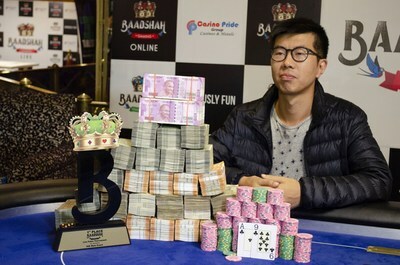 A multitude of fun promotions such as Deuce 7, Quad Baadshah, Full House, Flush em Straight, Flush em Royally had players having a gala time, giving them an opportunity to get up to 20% of their Buy-in back. An event first timer, Poker Pong - Beer Pong with a Poker Twist, was well received and turned out to be one of the most popular promotions. Amongst all, it saw Gokul Raj manage to plot a Straight Flush with just five chances thereby winning prizes on Baadshah Gaming. Co-Founder and Chief Card Shark at Baadshah Gaming, Madhav Gupta said, "The response and number of entries for the Rake Free April edition has been phenomenal and had all of us at Baadshah stoked. The entire aim of organizing Live Tournaments is to provide the players with a wholesome and seriously fun gaming experience. We want to mimic home games where players are free to come along with their buddies and have a great personal experience. Thereby creating memories which will last a lifetime. We've loved the support which we have received along the entire journey from the poker community and this only further motivates us to come back with bigger and better live editions. Baadshah has always been about the players and we love to give back to the community in whichever way possible." Towards the end, every player had something to take back with them along with some long-lasting happy and fun-filled memories. Baadshah goodie bags were gifted to the players which had a variety of merchandise, the favourites amongst which were the power bank and computer mouses. The rewards list also included a free ticket to the next edition's Main Event to the First Player who got busted from the April Edition's Main Event. To sum up, the BLT April '18 was a resounding success, leaving players wanting more and having their eyes on the lookout for the soon to be held next edition. Casino Pride Group backed online skill-based gaming start-up, Baadshah Gaming (http://www.baadshahgaming.com) is an online portal that offers games of skill such as Poker, Fantasy Sports and Rummy all over India. Baadshah Gaming was born from a desire to have an online experience that would live up to the thrills and credibility of the real-world version. The team has a combined experience of over 50 years and has brought everything from the live arena, out onto the virtual world. With transparency and credibility as its pillars, Baadshah Gaming aims to provide a smooth and seriously fun gaming experience for all the players.